This is a writing assignment that I like to begin the year with. 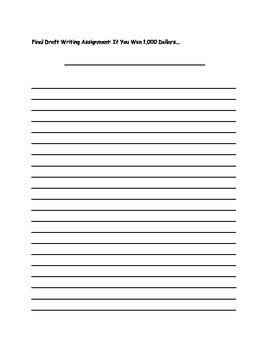 The students enjoy completing the assignment because it is very personal and easy for them to write about it. 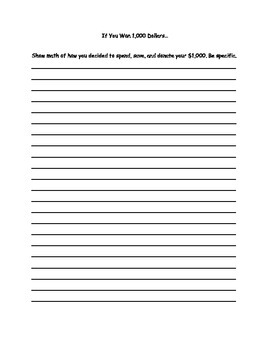 The prompt is that the student wins $1,000 from a writing contest. 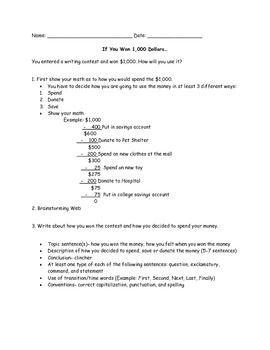 The student then has to decide how they are going to use the $1,000. They have to spend, save, and donate the money and they also have to use all of it. They are also introduced to exclamatory, command, statement, and question sentences, which they need to include one of each type of sentence in their writing piece. They also have to include transition words, topic sentence, and clincher. My students always enjoy this assignment!